Hampshire business Lucketts Travel is set to make a significant investment in its workforce over the next three years with the introduction of a new scheme. The coach firm, based in Fareham, has pledged to pay for every single member of staff to join The Transport Benevolent Fund (CIO) known as TBF. The move is part of the company’s commitment to supporting its growing workforce and comes as it was highly commended for its corporate social responsibility approach at The Solent Business Awards last week. TBF supports those who work in the public transport industry in Great Britain when they are in need, hardship or distress. Among the benefits Lucketts’ hundreds of employees could receive should they need it are cash grants, therapies such as physiotherapy, counselling, medical consultations, scans and tests, convalescence and bereavement grants. Managing director Tony Lawman said while he hoped staff would not come to be in a position to need some of the TBF’s services, he was pleased to be able to offer them for free. 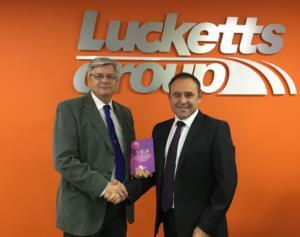 Lucketts Travel employs more than 320 people and has a heavy focus on supporting its staff. Among the benefits it offers are dedicated training schemes – with more than £60,000 invested in external exams and training in the last year alone – as well as free access to Perkbox, giving hundreds of discounts on everything from meals out and cinema tickets to home broadband and TV packages. Michael Gibson, TBF organiser for South West and Wales, said “We are delighted to welcome Lucketts Travel into the TBF fold. TBF is all about helping to improve members’ work-life balance and reduce staff turnover for their employer. We are finding more and more employers are seeing the advantages of TBF membership for their employees and the benefits it brings to all parties. To find out more about Lucketts visit www.lucketts.co.uk and the Transport Benevolent Fund at www.tbf.org.uk.